To some people, socks are nothing more than something that you slide onto your feet as you’re getting ready to start the day. Others, like you, understand that having a pair of the best dress socks on hand to complete your outfit can make a bigger difference in your day than many realize. A great pair of men’s dress socks will feel great while you’re stuck moving around on your feet, keep them regulated to the ambient temperature, and even can prevent smells from building up. Plus, quality dress socks will last through many wears so that you can have a regular, comfortable fit every time that you get ready for the day. What is it that makes one pair of men’s dress socks better than another? And how can you differentiate many pairs of socks that seem so similar? When we sat down to choose these top five pairs of the top dress socks on the market today, we looked at a few specific features: material, sizing options, quality, durability, price, and appearance. All of these pairs of socks stood out among the millions of socks on the market as the best of the best. Of course, it will ultimately be up to you to decide which pair of dress socks fit your specific needs. Whether you decide to prioritize durability or price, we’re certain that the right pair of dress socks for you can be found in our list today. The Dockers Men’s Classic Knit Crew Dress Socks are one of the most popular styles and fits of socks that Dockers has ever made. As such, you can find these socks on the feet of many types of men out there. The classic crew fit and quality of the socks at an affordable price are what makes them such a popular option for people to choose as their dress socks. The material on these socks is a blend that consists of 83% polyester, 15% cotton, and 2% spandex. The poly-cotton blend makes the socks very durable and soft on the feet. The inclusion of a little bit of spandex ensures a great fit even as your feet fluctuate in shape throughout the day. With the material blend made up of mostly polyester, they are very soft to the touch and are machine washable. Even after washing, these socks retain both their size and shape so that you can continue to wear them comfortably. At the top of these crew cut socks, there is a specific knit pattern that Docker’s calls the Stay-Put Top. This top is meant to keep the socks from rolling down while you are wearing them. This can be a common yet frustrating problem for those who regularly wear dress socks, so it is nice that the socks have a feature to combat it. Finally, these socks are a great value when bought in the sets that they are commonly sold in. Despite not being very expensive, the socks are comfortable and last for a long time, for these reasons they are one of our options for the best dress socks available today. Available at an affordable price, these socks are soft, durable, and will stay in place all day long. However, they are not ideal for individuals who have feet that sweat a lot. The Marino Men’s Colorful Cotton Dress Socks are a very unique option when it comes to what most people think of when they hear the words dress socks. But dress socks don’t have to be boring! If you’re open to and excited about the idea of having some funky fun dress socks, this set of colorful cotton dress socks from Marino might be the right choice for you. The fun patterns of this colorful collection are available in four different sets. Depending on what type of patterns, colors, and designs you’re interested in trying out as your next dress socks set, you can choose any one of these sets. While the colorful designs might be what draw most people to these socks, the patterns aren’t the only features worth mentioning. These cotton socks from Marino are known for the high level of moisture control that they provide. The cotton used is a very breathable blend, so you get the benefits of both a comfortable and breathable fit. The exact blend in the material used to create these socks is 80% cotton, 10% spandex, and 10% polyester. This blend makes this pair of colorful socks light, breathable, and fitted for nearly any size. Additionally, this specific blend of materials is very durable, so even after many wears, the socks will not break down or lose their elasticity. 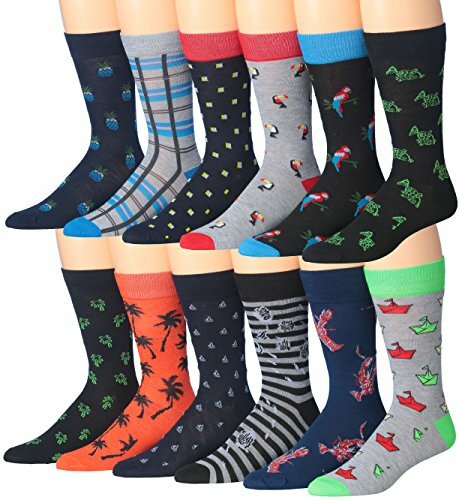 Although not as soft as some other brands, these fun and unique socks will keep your feet dry even during the hottest time of the day. They are durable and easy to maintain. Next up, we have another pair of patterned colorful dress socks that add a bit of fun to what might otherwise be a boring work outfit. 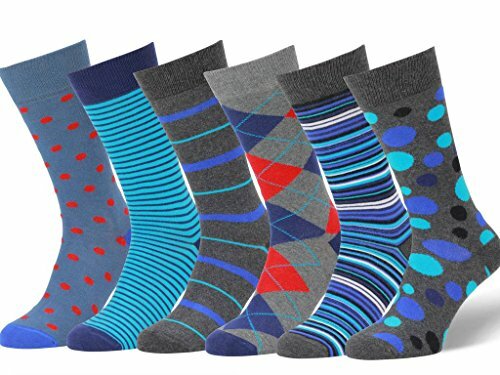 These patterned dress socks are available in six different color combination sets. Each of these sets comes with six differently patterned pairs of socks. With the various combination sets available, it should be easy to find the right set that fits in with your personal style. Another unique point about these socks that you might not be able to find in most common dress socks is that they are made in Portugal out of high-quality, European yarn. The high level of both material and craftsmanship put into these socks is one of the reasons they are so popular. The socks themselves are made out of what is known as combed cotton. When making combed cotton, short cotton fibers are removed from the blend while long fibers are left behind. For most people, cotton with longer fibers is both stronger and softer, so you will have very soft, comfortable, and durable dress socks. While the socks are prewashed to helped control sizing, these socks will need to be machine washed on the gentle cycle to keep them in shape. You can tumble dry them on low heat, but hang drying them will ensure that the socks will last longer. The Easton Marlowe Men’s Patterned Dress Socks are an affordable yet unique set of dress socks that can keep your feet comfortable while also helping you to demonstrate your personal style. These socks though need special care and attention and washed and dried. Now we’re going to take a look at the 3KB Men’s Dress Socks. These dress socks from 3KB are made to fit any type of personality. 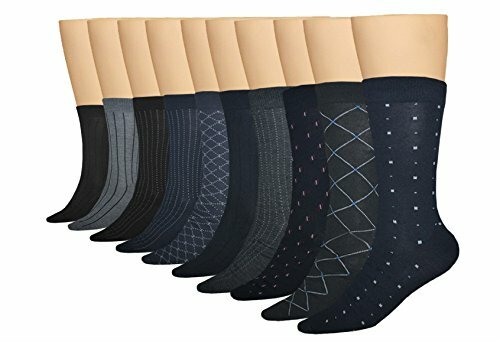 This set of 10 pairs of socks is, ultimately, the best value buy that we have found among all of the best socks at this time. For a low price, you can get 10 pairs of socks. While these socks have more durability issues than other socks that we have introduced today, that isn’t a huge issue at the price. There are 12 different color combinations available. From a pack of all solid socks to summer-inspired patterns that you can wear during warmer months, there is sure to be a pack that suits your current needs. The 3KB Men’s Dress Socks is made from a poly-spandex blend. The socks are 90% polyester and 10% spandex. This mix is made to fit more than anything else; you’ll find that the stretch of the socks will always contour comfortably to your feet. Additionally, the socks have folded toe seams and rounded heels; both of these features help create a custom fit. The same poly-mix that helps these socks fit comfortably also makes them both machine washable and dryable. Caring for your dress socks may become easier than ever before! Don’t think about it; just toss them in with your wash and be on your way! Whether you want your dress socks to be sleek, refined, and sophisticated or you hope to find something that matches your fun and loud personality, you’ll be able to find a color combination that suits your needs. This affordable product, though, won’t last that long and is not very breathable. Nonetheless, it is easy to maintain. Finally, we’re going to introduce another great-value option. 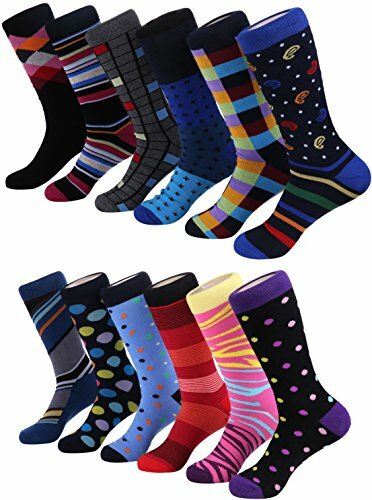 The James Fiallo Men’s Patterned Dress Socks comes with an amazing 12 pairs of socks for a great price, but what else do they have to offer? For one thing, this package offers more color combinations than any other set we have introduced to you today. There are 32 different color combinations that you can choose from when getting these patterned dress socks from James Fiallo. Realistically, many of these color combinations might be too wild for wearing to the office, but they are very fun and can be a great way to show off a bit of your personality when you are headed to the same office day in and day out. These socks come in a one-size-fits-all sizing. This can be a problem for those who have feet that fall on the lower or upper end of average men’s sizes. Still, the socks are a blend of spandex and polyester that have a good amount of stretch to them. This stretch helps the fit to feel custom and comfortable even if they are a one-size-fits-all pair of socks. Still, the spandex won’t make the socks fit feet that are very large any better than they would help them fit feet that are very small. Finally, the value of this set of socks is undeniable. The sock packs come with 12 pairs, so you can go to work for more than two weeks without needing to wash your socks if you needed to do so. That makes this a great value investment set of dress socks! Coming in at bold and fun designs, this set of socks is suitable for hot climates. These socks are very comfortable to wear and are designed to fit most feet. Now that we’ve looked at many of the top options for men’s dress socks that are available on the market today, it’s time for us to let you know which of them stands out among the others as the best of the best. 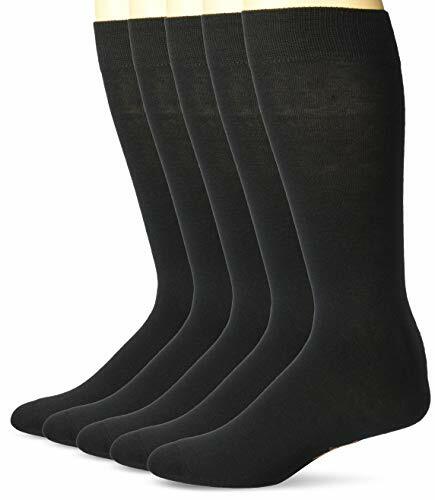 In our opinion, the Dockers Men’s Classic Knit Crew Dress Socks is the best classic dress socks. Being made from a great, comfortable material, the socks are designed with durability in mind. Additionally, the stay-top feature makes sure that your socks will not bother you by rolling down throughout the day. 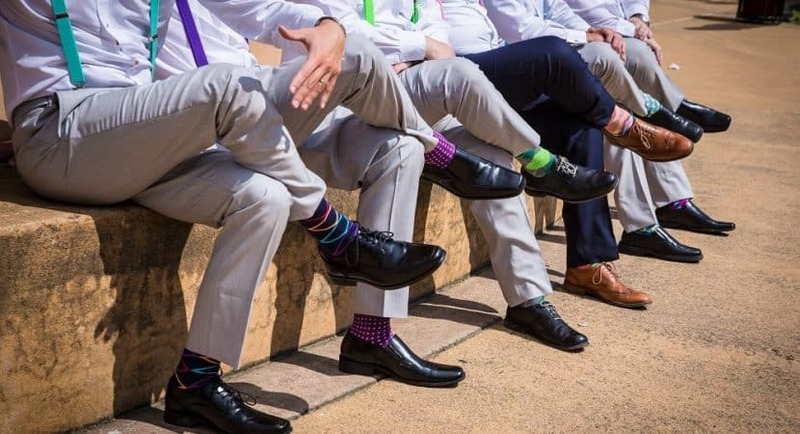 If you prefer to invest in socks that allow you to show off a bit more of your personal color, we believe the Marino Men’s Colorful Cotton Dress Socks is the best colorful option currently available. These socks are fun, comfortable, and reliable. What more could you ask for? Regardless of which type of socks on today’s list stood out to you the most, we’re sure that all of these pairs of socks can be considered to be great options that balance price with quality. With that in mind, choose the socks that best call out to you.